At one time or another, even the most skilled, experienced boaters have had a mishap at a boat ramp. Many elements have to be handled properly to safely unload a boat. It takes only one overlooked, minor detail to potentially ruin your day. Loading and unloading a boat at a busy boat ramp can be frustrating and stressful. 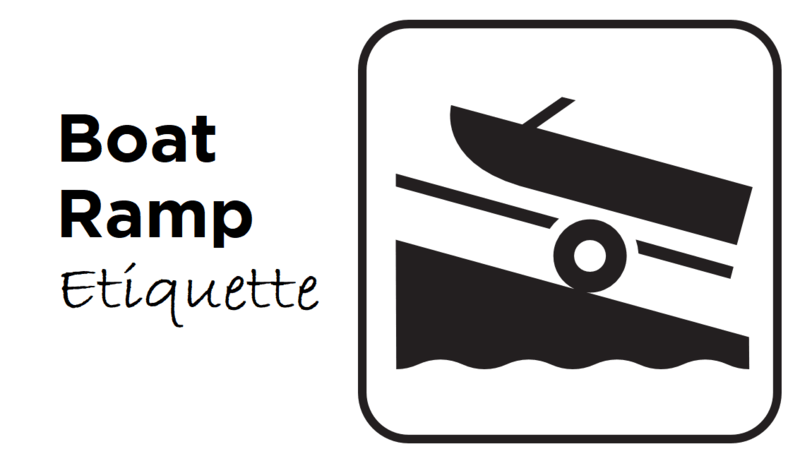 Before heading out for a day on the water, it is important to know proper boat ramp etiquette. No one likes ramp rage. Your drain plug may not be in place, causing your boat to take on water. Before you even get to the boat ramp you should create a pre-departure checklist, making sure you have included all safety items and necessary equipment on your boat. Once you are ready to launch. 1). Double check the drive unit before backing down. Make sure your drive unit is secure in the raised position to prevent it from scraping the ramp. This is why the pre-departure checklist is critical. 2). Line your boat up with the launch pad and ready the bowlines. The bowline is what keeps the boat from floating away once it leaves your trailer. Prepare the bowlines before approaching the ramp so you don’t block anyone from launching or retrieving their boat. 3). Brace yourself when releasing the boat off the trailer. I have seen people taken off guard and pulled into the water by the force of a launched boat. 4). After launching, quickly move both the towing vehicle off the ramp and secure your boat to the courtesy dock. The courtesy dock is not a hang-out spot. It is a dock to temporarily retrieve and drop of passengers. Clogging up the courtesy dock can cause inconvenience to fellow boaters. It clogs up traffic of launching and retrieving boats at the ramp. 5). Remember to be polite and respect fellow boaters. Think about who is waiting in line next. Get in and get out is the name of the game. When it comes to retrieving your vessel at the boat ramp, the same rules apply. I cannot begin to tell you how many times I have seen boaters come to the boat ramp after a long day of drinking and boating, this can make things very dangerous. 6). Get out on the water and have a great day!